This Post has already been read 353 times. Pakistan’s No.1 Data Network Zong 4G has partnered with Careem, Pakistan’s top ride hailing app, to bring yet another convenience for their users. Now Zong 4G customers can avail 2 GB free internet for an entire week simply by taking 3 rides with Careem within a week. This incentive is available for all Careem car types. 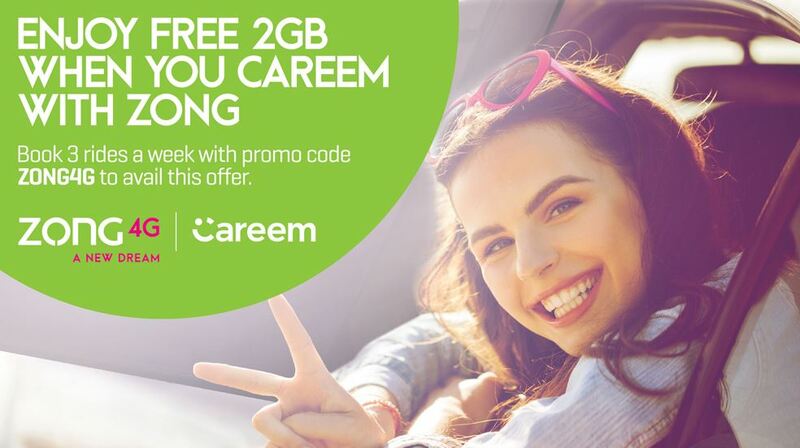 The offer can be availed by all Zong users with number series ranging from 0310 to 0318 by using Promo Code “ZONG4G” while booking their rides on Careem. Upon completion of 3 rides, the 2 GB incentive will be posted within 3 working days. By adopting state of art technologies in telecom arena, Zong 4G’s pursuit for optimal service delivery to users is driving the company to take adequate measures to keep a consistent pace with the unfolding demands of modernized digitization. As the pioneer of 4G services in Pakistan, Zong 4G is empowering its customers and connecting them through widest 4G network. The company is known to be visionary in terms of leading the digital revolution in the country and helping many shape their future. With more than 10,000 4G enabled cell sites, boasting a network that spans as far and wide as one can go, Zong 4G is the ideal choice for customers on the go. You can also read about Zong Uber Offer here.